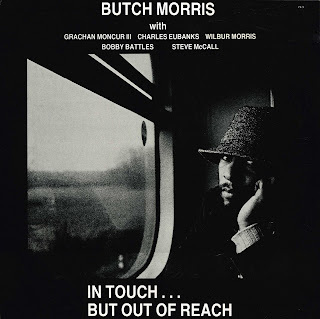 I would have first heard Butch Morris on one of David Murray records, can't remember which. Very memorably he played on Murray's incandescent 'Home' (1982) as well as Frank Lowe's wonderful 'Exotic Heartbreak' (1981). Butch played cornet - not trumpet. Beautiful laconic style. Seeming always to be more interested in the sound & texture of *the ensemble* rather than simply blowing hot on his own horn. And always - in his own improvising - that feeling of the blues. His development of and move toward Conduction produced an always-interesting string of records - some arguably more successful than others. Right now I am playing 'The Arkbank Conduction' of The Suleyman Erguner Ensemble - traditional Turkish musicians augmented with electric guitar, electronics, drum machine, harp, and Hugh Ragin on pocket trumpet - conducted by Butch Morris. It works - it's fantastic. By the early 90's - evidenced on Dust to Dust and the mammoth 10CD Conduction series on the New World label - Morris was playing much less cornet and focussed on developing his conduction, for wide varieties of ensembles in a wide variety of countries. That he could still return to small group playing on cornet and produce brilliant music can be heard on the terrifyingly good Burning Clouds on FMP from 1993. 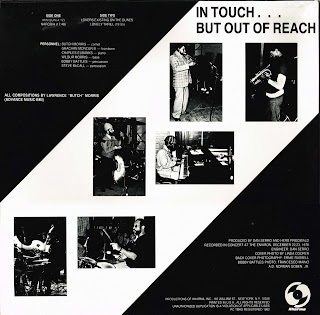 In Touch..But Out of Reach was recorded live in 1978 (though there is no audience noise). Even in 1978, Morris seems most interested in tones and textures he can produce from *the band* and not merely in head-solo-head arrangements or collective free improv. Rhythmically, he's included 2 drummers for a reason, and both Steve McCall and Bobby Battle play off one another as well as off the pitched instruments - even if the recording quality is not best placed to allow the processing of many of the details unfortunately. 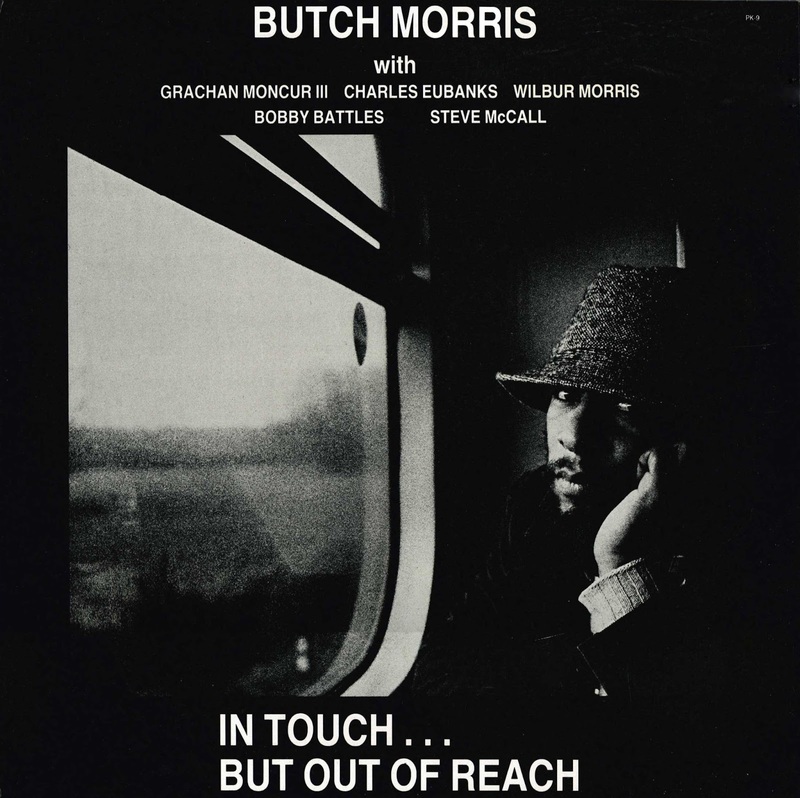 His other players however are damn monsters - those who know Moncur will relish the chance to hear more of him, Butch's brother Wilbur is a energetic and creative bass player, and Charles Eubanks is in no way outclassed by his colleagues. http://www.grachanmoncur.com/ Please please - if you derived enjoyment from this recording, visit Moncur's website, check it out and buy one of the recordings of this still living and grossly undervalued yet outstanding musician. Exploration from 2004 on Capri Records is superb. Oh good lord, this is wonderful to see. Thank you so much! A Butch Morris I don't know. I had no idea this one existed. It almost makes me want to kiss your...snout. Thanks! Yes , wonderful , i've seen this record around , but have never heard it , iprobably avoided it because the Kharma records i Had bought were sonically disappointing sounding like they were recorded in a drain pipe... thanks for the informative post. Thank you so much for your blog. it's truly amazing! I've just found it while trying to locate Butch Morris' In Touch But Out Of Reach. i'm screaming out loud!))) i really do, cause i'm so happy to grab this beautiful thing! Igor - you have picked up something there about the sense of sadness. 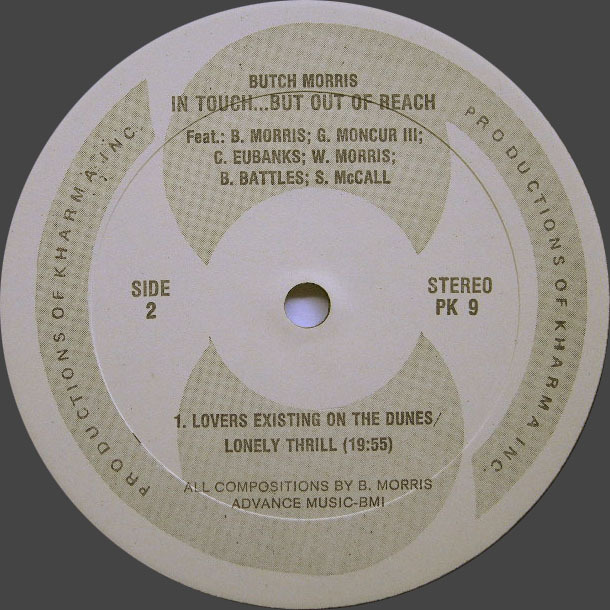 Maybe just tied in with sadness about his death - but also for me, the title of the record, the intelligent sad expression of the cover photo, and even a pathos in Morris pursuing his own lonely furrow to work in for so many years. I was going to write something like this earlier, then thought 'nah that's silly'..
What is cheering though is the enthusiasm some have - so thanks Igor, Newk etc .. It's been one of the central tenets of this blog that it be Open to all and not go private. But can anyone out there in public blogsville tell me why we wouldn't just email links to our own small group of friends,trade CD burns, or start a private file-hub away from public gaze? Congrats Anonymous - you're our last Anon request we're servicing. The Messiaen LP new link is on the comments on that post. Thanks a lot Serviceton, I hadn’t heard this record. Like Sotise, I avoided Kharma vinyl fearing crummy sound. I first heard Butch Morris’s cornet on a couple of very fine Frank Lowe albums in 1976 (“Tricks of the Trade” and “The Other Side”) on the French labels Marge and Palm. Then in the excellent David Murray Low Class Conspiracy band in 1977 on the German Circle label, (with drummer Stanley Crouch in pre poison-pen days). 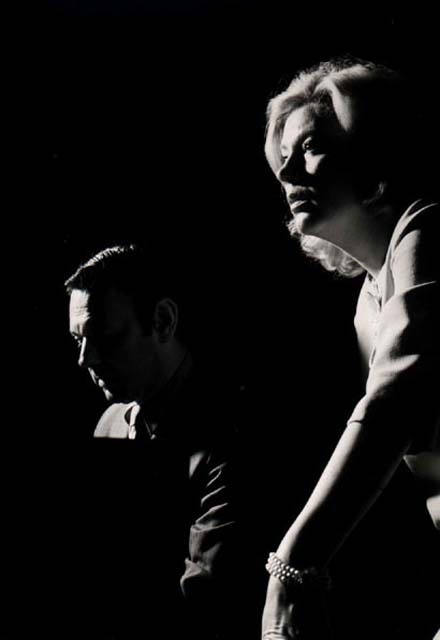 Follow those with Murray’s 4tet on “Last of the Hipman” and “Let the Music Take You” on Red and Marge. All very fine, early, records with Morris’s cornet in fiery front-line action with Lowe and Murray. These guys were full of youthful passion in those days. Some of the finest jazz of the 70’s. Despair not! Blogging means not quite getting the public rewards one would wish for. Going private becomes increasingly claustrophobic and ultimately a dead-end. Thank you! Very much appreciated! I used to have this on vinyl back in the day... can't wait to hear it again. You've made my morning! Good on you Anon, enjoy. glmlr - always nice to hear from you & thanks for the supportive word. All good records, those you mention - most with a freshness I yearn for in much modern listening. The Kharma label - crummy sound? ! ? Hang about.. Thanks Serviceton for another great post. Looking forward to hearing it. Apologies for not commenting every time I download. I fear many times I am part of the 98%. Anon[Feb 14] - thanks for the link to the interview - very worthwhile. Wally Gelatau and Anon[Feb 25] - thanks for putting fingers to keyboard and commenting - appreciated ! Been awhile since I stopped by and I found a couple of beauties, this being one of them. Dling now so thanks very much!! Thanks for sharing this.I only knew of Morris as a sideman with Frank Lowe and David Murray from way back.Love the sound of Moncur's trombone.Sounds so much like a human voice. Again, thank you. I haven't heard these, and I like Morris.